This Master Profile was written by NM Mark Holness, Jamaican Chess Federation. All Rights Reserved. The chess career of Jamaica's number one rated player, NM Shane Matthews, reads like a fairy tale. 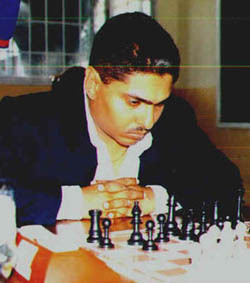 After learning the game in 1974, Matthews played his first Tournament when he placed second in the first qualifier of the National Junior Championships of 1981. Just two years later he achieved the title of National Master in 1983, with the help of a winning streak of five straight games in the X-mas ladder of '82 and some open tournaments in '83. Known in most chess circles as the "Magician" Matthew's strongest quality is probably his great determination and fighting spirit even in inferior positions. His real strength is best seen in the middle game, when theory recedes in the background and tactical blows and concrete variations become of paramount importance. While his years of experience has enabled him to develop a keen strategic and positional understanding, Shane Matthews is first and foremost a Chess Tactician par excellence. This many time National Champion won his last national Championship in 1997 and came second in the National Championships of 2001, behind FM Warren Elliott. He remains to date, the only Jamaican to have attained a rating of over 2400 and is currently the highest ranked player in Jamaica. He is a current member of the JCF executive body and chairs the Ratings committee. 1988 Olympiad in Greece; Scored (7/13) on Board 4. NM Shane Matthews has recently stamped his dominance on the chess scene with a winning streak of back to back victories in some major Open Tournaments. His last open tournament victory occurred when he placed first in the 2002 Easter Open Tournament. Shane Matthews is indisputably one of the greatest Players in the history of chess in Jamaica. And he is still playing. His ability to remain inside the "Big four" which also include FM Warren Elliott, FM Grantel Gibbs, and NM Jomo Pitterson is amazing. His contribution to the development of Jamaican chess, his longevity, his achievements and his Sportsmanship are remarkable. See Shane Matthews - Equitable Brown, Jamaica Ch, 2002.